Gate automation for swing gates and drive for sliding gates are available in our company’s offer. We work with the leaders in this industry are companies such as FAAC, Nice, CAME, COMMAX, Tousek. Automation for swing gates consists of electric actuators, photocells, control center, remote controls and lamps signaling the operation of the gate. Automation for a sliding gate consists of the same set only without electric actuators. In this case, the actuators were replaced by an electric drive equipped with a gear wheel, which is combined with toothed bars fixed to the sliding gate structure. The right and left-hand rotation of the gear is an executive element for opening and closing the gate. In the case of sliding gates, two criteria should be considered: the weight of the door and the way it is used. For private properties, where the weight of the door will not exceed 500 kg – the FAAC 740 or FAAC 741 automatic drive will be suitable. 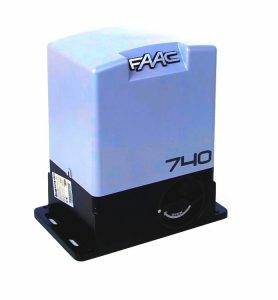 For doors that are used more often, in which the weight does not exceed 600kg – the FAAC 746 ER automatic drive will be suitable. For industrial doors whose weight and frequency of use are much higher – the FAAC 844 ER automatic drive will be suitable. 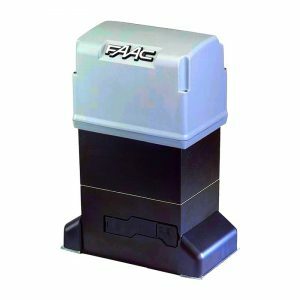 FAAC 391 – it is a perfect solution for wide poles, where it is impossible to mount the automators inside. 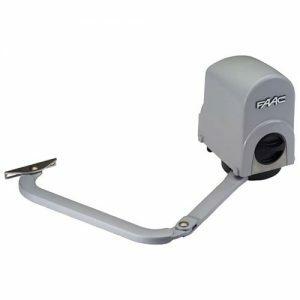 This model is equipped with an articulated arm that allows the gate to be opened. 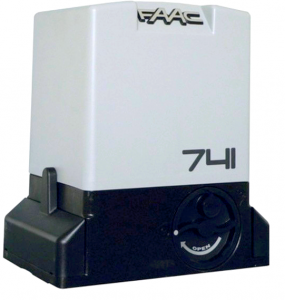 FAAC 414 – consists of cylinders for swing gates, with a maximum sash length not exceeding 4 m.